Some clients can feel crystal energy right from the beginning and some clients cannot. Clients who can feel crystal energy need no special help or direction. Clients who cannot “feel” the energy do need support and direction. The first step is to explain to such clients that just because they can’t feel the action of the individual crystals does not mean that nothing is happening. 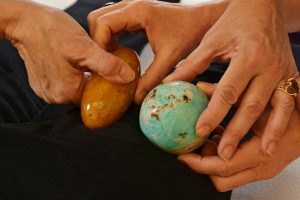 Furthermore, it is imperative that as practitioners we do not step it up a notch and blast such clients with even more crystal energy in an attempt to force them to feel – because there is such a thing as an overdose. Instead, we need to direct our client’s attention to the overall effect of the session. If the client walks in fatigued, does she walk out refreshed? If the client walks in agitated, does she walk out calm? If the clients walks in depressed, does she walk out uplifted? And in fact, this is where we ourselves need to direct our attention too! Secondly, we need to use techniques that interact directly with the physical body and generate physical sensation. There are multiple infusion techniques which do this. [photo] If a client has trouble feeling energy, it is helpful to alternate energetic techniques that do not touch the physical body with energetic techniques that do make contact with the physical body. Thirdly, we need to understand why some clients feel crystal energy and some don’t. It took me ages to figure this out! The reason is straightforward – some people are dominantly “feelers” and other people are dominantly “thinkers.” The people who are “feelers” will easily feel the crystal energy. The people who are “thinkers” will be equally affected – but in their thinking. Consequently, we need to direct these clients to track how their thinking changes in response to the crystals, ranging from the mood of the thoughts, through to the quality and the content. Lastly, I want to note that the ability to feel the energy of crystals seems to have a generational component as well. Just this week I saw a teenager who was fascinated by the session! I expected him to have a “this is weird” and “I’m not sure if anything happened” reaction, but on the contrary, he could feel every detail. I could tell that he could feel the crystals because I could see his eyes tracking in the way that indicates detailed attentiveness. Other children that I have worked with have also been much more articulate in describing the actions of the crystals than the majority of my adult clients.